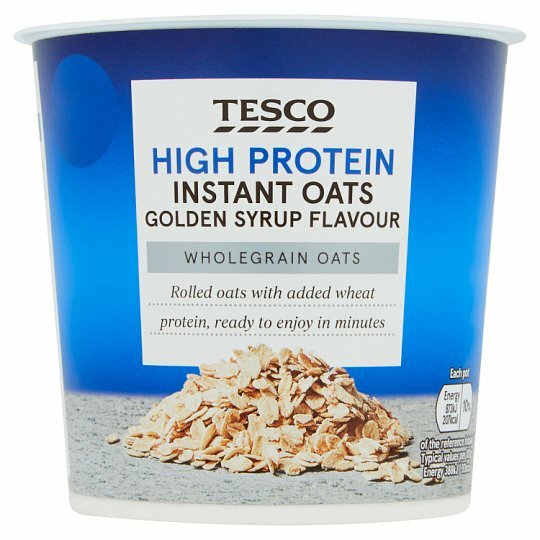 Instant oat porridge with wheat protein and golden syrup flavour. Wholegrain Oats Rolled oats with added wheat protein, ready to enjoy in minutes. INGREDIENTS: Oat Flakes (58%), Sugar, Dried Skimmed Milk, Soluble Wheat Protein (10%), Flavourings. May contain almond, brazil nut, hazelnut and pecan. For allergens, including cereals containing gluten, see ingredients in bold. Also, may contain peanuts and nuts. Remove foil lid, stir and add boiling water to fill line (approx. 170ml). Stir well and stand for 2-3 minutes. Stir well before eating. Add more boiling water if required to adjust the consistency of the porridge. Do not reheat.